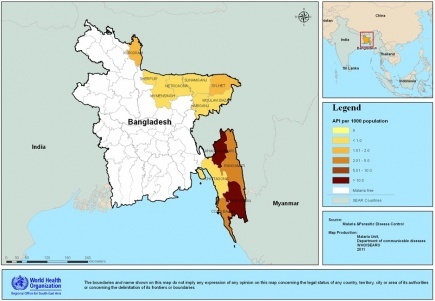 Malaria is heterogeneously distributed in 13 endemic districts of Bangladesh, potentially as a result of variations in ecological settings, socio-economic status, land cover, and agricultural practices. Malaria control relies in Bangladesh only on treatment and supply of bed nets. 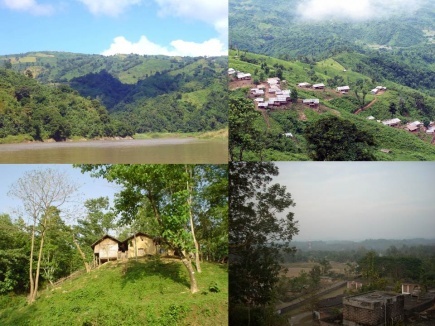 It is highly endemic in Chittagong Hill Tracts (CHT) which is covered with forests and hills. Major transmission takes place during the rainy season. Models using hydrological, climatic and topographic variables for the prediction of malaria transmission have never been developed for Bangladesh. Due to the unique ecological settings in CHT, hydrological models developed in other parts of the world, particularly in Africa, are neither feasible nor cost effective for Bangladesh. In general, any model should consider environmental and entomological risk factors, bed net coverage and usage, health facilities, malaria control efforts, and other socio economic information. Currently, no such model exists anywhere, and such a model would risk becoming overly complicated. A model based on local ecology and risk factors is essential for malaria control in the CHT, Bangladesh. This project aims to develop a risk model using hydrological, topographic, climatic, and entomological parameters. The model will be capable to simulate overland flow, pooling and evaporation from open water bodies. Runoff will be estimated using runoff ratios or a curve number approach. Inundations will be estimated from runoff patterns and local topography. The model will help explain malaria risk on a small-scale. The major outcomes will be an easy to use hydrological-malaria model and increased knowledge of malaria risk factors in the CHT in Bangladesh. Knowledge arising from this project will be invaluable for research capacity development on malaria control in Bangladesh. The proposed model will be instrumental for Bangladesh to assist in forecasting, improve malaria control decisions, and reduce disease outcome. This project aims to develop a risk model using hydrological, topographic, climatic, and entomological parameters. The model will be capable to simulate overland flow, pooling and evaporation from open water bodies. Inundations will be estimated from runoff patterns and local topography. Contribute to improved health and welfare of people in Chittagong Hill Tracts, Bangladesh. 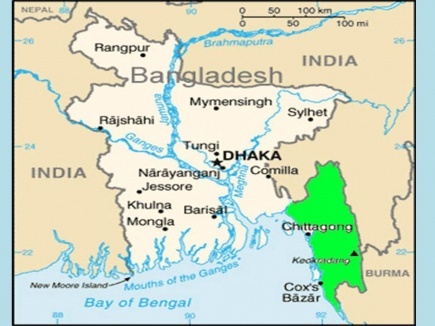 Determine the role of local topographic and climate variables in the spread of malaria in Chittagong Hill Tracts, Bangladesh. Malaria control can only be successful if the right methods are used at the right time in the right place. Topographic attributes provide physically and ecologically meaningful description of how topography affects malaria risk via suitability for potential mosquito breeding. Exploring the relationships between these environmental parameters and malaria incidence in Bangladesh will provide accurate background information for the model. The proposed model will be instrumental for Bangladesh to assist in forecasting, improve malaria control decisions, and reduce disease outcome. A GIS-based analysis of runoff generation and accumulation will enable an assessment of current and future risk patterns for malaria. The GIS-analysis involves the identification of runoff path ways and areas prone to inundation. It will prove useful in identification of areas within communities at higher transmission risk at the household level. The hydrological model will predict locations of rainwater pools after rainstorms, and their persistence. The predicted water locations will be linked to the characteristics of field-identified breeding sites and their potential mosquito productivity. The experiences and knowledge originating from this project will be valuable for all of CHT. Knowledge arising from this project will be invaluable for research capacity development on malaria control in Bangladesh. The use of high resolution images, GIS, hydrological techniques, climatic parameters and malaria transmission, will expand the current knowledge of risk model using hydrological techniques (1,2,3,4,5) and generate new hypothesis in this field.